I have a few bibs to make for a boy. I wanted something a little different, so I used what I had and this is what I came up with. 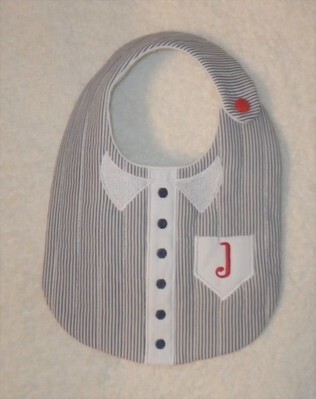 The ITH bib is from Designs by Juju, and the font is Aurora from the same site. I love this bib! So cute! I've searched the juju site, and I can't find this design at all. Can you give me a hint about where to look? I have a great nephew arriving soon, and this would be perfect for him. Thank you. It looks awesome. I am so sorry , the actual shirt design is my own, the ITH bib is from the site. I think they are referring to the blank bib you used, not your own design to embellish it. At least noah is. Your Bib is sew cute! Lovely...what is the hoop size and finished bib size? This was a men's shirt at one time! Love this!! Cute design and great stitching,! !